The Air Force had maintained that it could not estimate how many troops might have had their remains sent to a landfill. The practice was revealed last month by The Washington Post, which was able to document a single case of a soldier whose partial remains were sent to the King George County landfill in Virginia. The new data, for the first time, show the scope of what has become an embarrassing episode for vaunted Dover Air Base, the main port of entry for America's war dead. "It would require a massive effort and time to recall records and research individually," Jo Ann Rooney, the Pentagon's acting undersecretary for personnel, wrote in a Nov. 22 letter to Rep. Rush D. Holt (D-N.J.). "What the hell?" Holt said in a phone interview. "We spent millions, tens of millions, to find any trace of soldiers killed, and they're concerned about a 'massive' effort to go back and pull out the files and find out how many soldiers were disrespected this way?" He added: "They just don't want to ask questions or look very hard." Senior Air Force leaders said there was no intent to deceive. "Absolutely not," said Lt. Gen. Darrell D. Jones, the Air Force's deputy chief of staff for personnel. This week, after The Post pressed for information contained in the Dover mortuary's electronic database, the Air Force produced a tally based on those records. It showed that 976 fragments from 274 military personnel were cremated, incinerated and taken to the landfill between 2004 and 2008. A separate federal investigation of the mortuary last month, prompted by whistleblower complaints, uncovered "gross mismanagement" and documented how body parts recovered from bomb blasts stacked up in the morgue's coolers for months or years before they were identified and disposed of. The problems also transpired at a time when the mortuary was shielded from public scrutiny. News coverage of the return of fallen troops to Dover was banned by President George H.W. Bush in 1991 before the first Persian Gulf War. The ban remained until April 2009, when the Obama administration lifted it. The Air Force said it first cremated the remains and then included those ashes in larger loads of mortuary medical waste that were burned in an incinerator and taken to a landfill. Incinerating medical waste is a common disposal practice but including cremated human ashes is not, according to funeral home directors, regulators and waste haulers. Air Force officials said they do not know when the landfill disposals began. They said their first record of it is Feb. 23, 2004. The mortuary database became operational in late 2003. 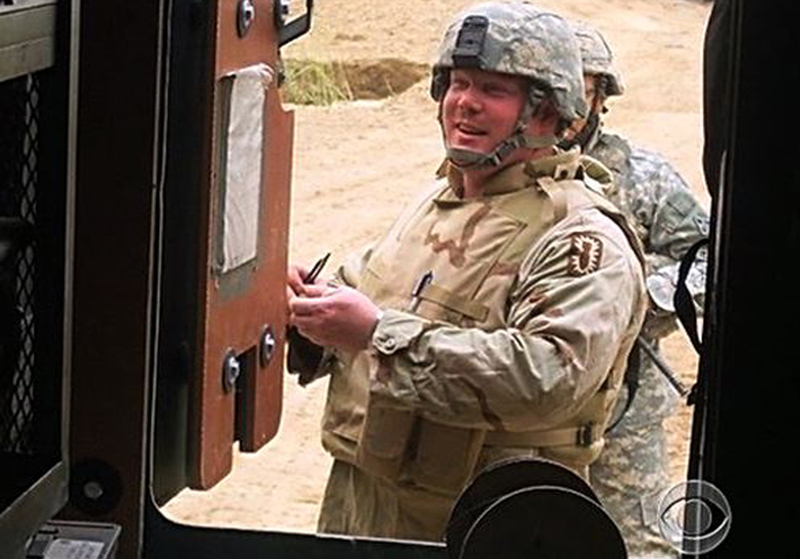 At left, watch CBS News correspondent David Martin's original report on the widow of Sgt. 1st Class Scott Smith finding out 2 years later that part of her husband's body was incinerated and disposed of as medical waste. The Air Force said mortuary leaders decided to end the practice in May 2008 because "there was a better way to do it," Jones said. The military now cremates unclaimed and unidentified body parts and buries the ashes at sea. Jones said the Air Force did not need to inform relatives of troops whose remains ended up in the landfill because they had already signed forms stipulating that they did not wish to be notified if additional remains were identified. The forms authorized the military to make "appropriate disposition" of those subsequent remains. Asked if the landfill was a dignified final resting place, Jones replied: "The way we're doing it today is much better." Gari-Lynn Smith, the widow of an Army sergeant killed in Iraq, said she received an e-mail in July from Trevor Dean, the mortuary director, saying that incinerated remains had been taken to landfills at least since he began working at Dover in 1996. Dean is one of the officials facing discipline for his role in the reported mismanagement at the mortuary. Smith's husband, Sgt. 1st Class Scott R. Smith, a member of a bomb-disposal unit, was killed on July 17, 2006. In 2007, she began asking the military what happened to some of his remains that were identified after his funeral. After four years of letters, phone calls and records requests, she received a letter from the mortuary in April stating that the military cremated and incinerated those partial remains and disposed of them in the King George County, Va., landfill. "I hope this information brings some comfort to you during your time of loss," read the letter, signed by Dean. Smith was infuriated. "They have known that they were doing something disgusting, and they were doing everything they could to keep it from us," she said in a phone interview. In May 2008, then-Defense Secretary Robert M. Gates ordered a detailed review of policies at Dover after an Army officer complained that the mortuary had cremated a fallen comrade at a nearby funeral home that also cremated pets in a separate chamber. The review team ordered changes, emphasizing the need to ensure the highest levels of dignity and honor. The Pentagon would not release the report, which was overseen by David Chu, who was undersecretary of defense for personnel. A copy obtained by The Post, however, shows that the landfill disposal practice was never reviewed or mentioned. Chu, now president of the Institute for Defense Analyses in Alexandria, declined to comment. Private contractors hired by the Air Force to handle the remains' incineration and disposal of the residue said they were unaware that they were transporting the ashes of humans. Records show that the Air Force hired the contractors to dispose of medical waste and did not specify that cremated body parts were included. MedTrace Inc. of North East, Md., had Air Force disposal contracts between 2004 and 2007, records show. Don Holland, a manager for the company, said his employees picked up boxes of sealed containers from the Dover mortuary. "They were certified as medical waste that had been properly treated -- that's it," Holland said. "We don't go looking at what's in there. It's sealed." MedTrace took the items to an incinerator in Baltimore, according to state records in Delaware, where the mortuary is located. Holland declined to discuss the incineration and which landfill his company used. Lisa Kardell, a spokeswoman for Waste Management Inc., which operates the King George County landfill, said the firm has no record of a contract with MedTrace for the years 2003 through 2008. She said that Air Force officials have not returned calls over the past two weeks from her company's lawyers, asking which haulers would have been handling the Dover materials and the disposition of the ashes. "Obviously, we would be opposed to taking cremated remains of our servicemen and servicewomen and putting them in our landfill," Kardell said. "But it sounds like a lot of us were pulled in unknowingly to this unfortunate situation with the Air Force," she added. "It's a moral thing," said Jeff Jenkins, the manager of the King George County landfill. "Someone killed overseas fighting for our country, I wouldn't want them buried -- any part of them -- in the landfill."